Designing an amazing kitchen starts with planning your kitchen in a way that fits both of your aesthetics and lifestyle. It’s about incorporating design and function to create a kitchen that adds quality to your life. Why so? Because the kitchen remains one of the most important rooms in the house and one that you would use daily, no matter what your lifestyle is. 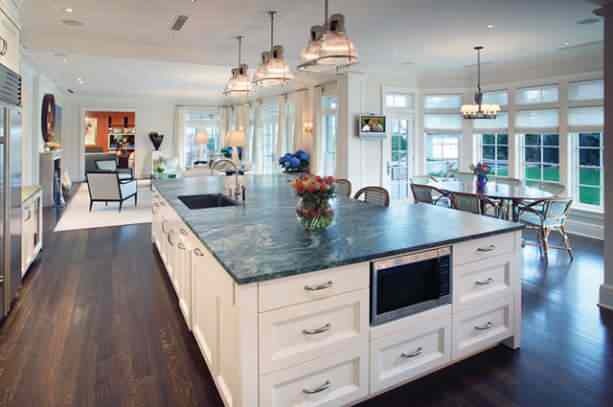 We’ve compiled 7 design strategies for planning an amazing kitchen as shared by architects. Much like with any other form or part of real estate, location is key. You can’t want a kitchen to be the heart of your home if you plan to place it at the other end of a long lot, right? The best kitchen location is somewhere that has access or near to the garage, great room, laundry room, and mudroom. Makes your daily life easier. This follows what we wrote above. You want the kitchen to be accessible to where you mostly spend time in, right in the heart of your living areas if possible. More so, most families gather in the kitchen for more than just cooking. It is common for children to do their homework in the kitchen and for some people to do casual entertaining in. An open plan kitchen is perfect for this. While the triangle of stove, sink, and refrigerator still works, it would be best to consider your specific needs when planning a kitchen layout. One thing to consider is to have plenty of counter space near the sink and the stove to make your life easier. Having enough space for small appliances is a must too. A kitchen island is not an outdated concept; it’s actually a very smart move to have one if you have the space for it. A kitchen island can be an extra work surface, storage, and even a table for when you want informal meals. It will also make the kitchen a more welcoming room for other family members as they will have somewhere to hang around in. This may not work for everyone but if your space and home layout allows for your kitchen to have outdoor access, then go for it! This will be great during the summer for when you are entertaining outside on your patio or garden area. Kitchens are prone to clutter so do not underestimate your need for storage! Think about all the food, flatware, small appliances, and other things you’ll need to store. Inject your personality into every aspect of your kitchen. Don’t be afraid to opt for fun colours, unique backsplash, and adding design elements that appeal to you. After all, its your kitchen! Looking for an Oakville home with the kitchen of your dreams? Browse the available luxury homes in Oakville in our listings and you might just find one that’s exactly as you like. Do not forget to contact us for scheduling a viewing!